This is made out of a solid piece of 6061 billet aluminum(anodized RED) .The cam gridle acts and performs just like a crank gridle. Replaces the stock cam rails and stock cam rail bolts(only use the 4 center stock bolts which are used for the valve cover mounting nuts) with this one piece CNC billet unit and ARP 12 point Bolts. This helps eliminate cap flex and keeps the cam tower solid for max rpm and valvetrain stability. Also improves oiling within the head with less windage. 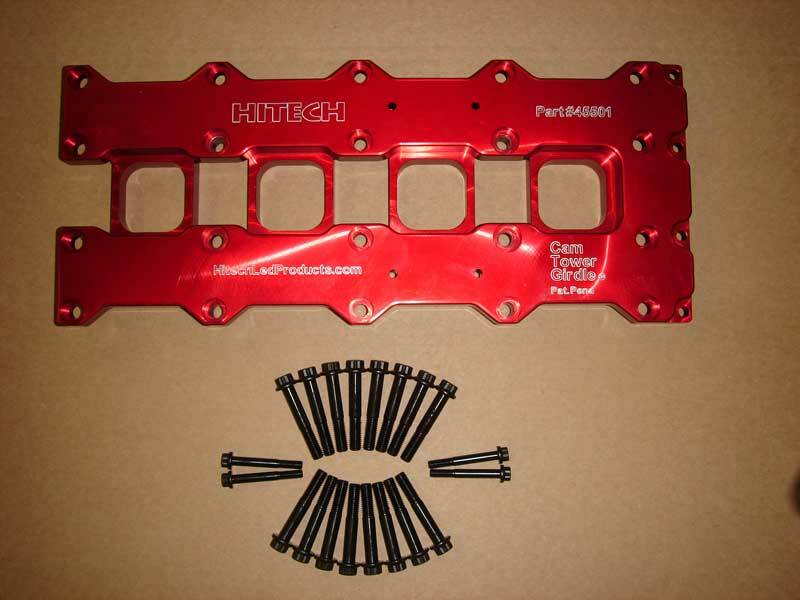 Fits all types of cams and stock valve cover with absolutely no modification... Also uses Stainless steel dowel pins to align in the original/Stock location. Just unbolt your stock cam rails and install the new Billet cam gridle with ARP 12 point bolts are much stronger than the stock bolts. You retain the stock torque specs. Fits all B series Honda engines.